Please show your support on the street or from your own home! We intend to make a collage of everyone’s pictures, but please share on Facebook and Twitter too (#FreedomForÖcalan). THE WORLD CAMPAIGNED FOR THE RELEASE OF NELSON MANDELA. NOW WE MUST TAKE ACTION TO SUPPORT THE CALL FOR FREEDOM FOR ÖCALAN. This is a call that has been taken up by Unite, the GMB, and other unions, and endorsed by the TUC and STUC. Its importance was recognised by last year’s Durham Miners’ Gala – the biggest trade union gathering in the UK – when they chose it as their international cause. The republic of Turkey is founded on an ethnic Turkish nationalism that allows no room for the expression of other identities. 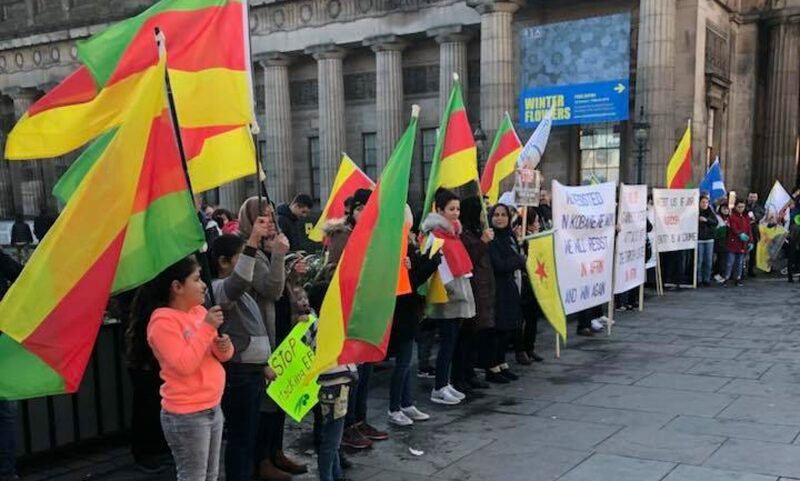 The large Kurdish minority have found themselves subject to brutal attempts at Turkification, which have outlawed their language and culture and repeatedly subjected them to devastating collective punishments. In 1978, a group of Kurds felt that the wider leftist movements, of which they were part, failed to understand the importance of this cultural suppression, and they established their own Kurdistan Workers’ Party (PKK), under Öcalan’s leadership. On 15th February 20 years ago, Kurdish leader, Abdullah Öcalan, was abducted, with the help of the CIA, and brought back to Turkey, where he was condemned to death. His sentence was commuted to life imprisonment when Turkey ended the death penalty in order to be considered for EU membership. For 20 years he has been held on the closely-guarded island prison of Imrali. He has used that time to develop the ideas that have inspired the feminist, multicultural, grassroots democracy in the autonomous Democratic Federation of Northern Syria, and to try and negotiate a peaceful and respectful future for the Kurds in Turkey. But in recent years he has been kept in total isolation, denied even the visits of his family and his lawyers. The PKK has morphed from a Marxist-Leninist separatist movement to a force for local autonomy and cultural freedom, but it is still seen as unacceptable by the Turkish state. While the PKK, like Mandela, has fought a guerrilla struggle, their ideas have also been pursued through constitutional politics. However, even the predominantly-Kurdish Peoples’ Democracy Party (HDP), which keeps firmly within the legal framework, has faced constant harassment and violent physical attacks – and has seen most of its MPs and mayors arrested. For millions of Kurds, Öcalan is not only their acknowledged leader, but a vital symbol of their desire for freedom. For everyone who hopes for a better world, he should be acknowledged as the driving force behind the inspiring social and political changes taking place in predominantly-Kurdish Northern Syria. And he is widely recognised as the person who has the support, the will and the ability to negotiate a peaceful settlement, when the Turkish government agrees to engage. The importance given to Öcalan is reflected in the more than 300 people now on hunger strike to press their call for the end to his isolation. This modest demand simply requires Turkey to follow its own constitution and allow visits from his family and lawyers. These visits are also required by international human rights law, which regards isolation as a form of torture. This hunger strike was led by HDP MP Leyla Güven, who, on Friday, reaches her 100th day without food. The 14 hunger strikers in Strasbourg and Imam Sis in Wales will then have reached day 61. Most of the hunger strikers are political prisoners who are treated extra harshly. All these people are putting their lives on the line because other forms of campaigning have left the world unmoved. If you want to give support to the hunger strikers’ basic call for human rights, please check out some suggested actions here.